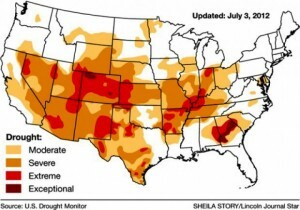 The National Drought Mitigation Center at the University of Nebraska-Lincoln has been monitoring droughts for a dozen years and it says that the current dry spell afflicts more of the nation than ever before. Analysis of the latest drought monitor data revealed that 46.84 percent of the nation’s land area is in various stages of drought. The previous record was 45.87 percent in drought set Aug. 26, 2003. The map below (from the National Drought Mitigation Center) shows the situation as of Independence Day, 2012. 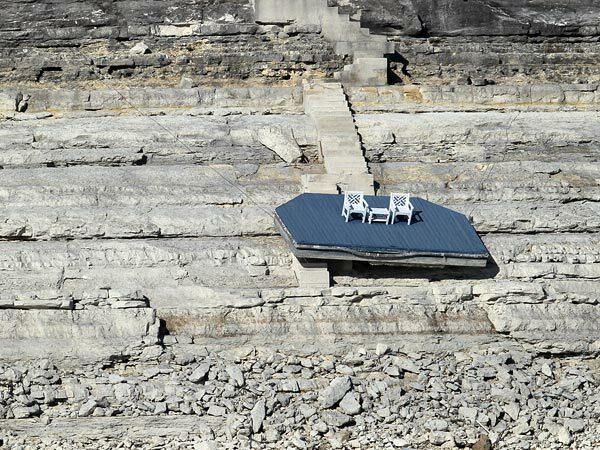 Across much of the western United States, extremely dry conditions have caused cities, farms, and businesses to fear for the future of their water supply as demand outstrips availability.The striking picture below tells it all. See more striking drought pictures in National Geographic’s special drought feature.